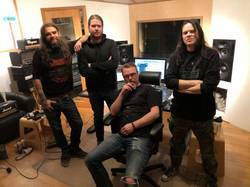 Sweden's MARTYRDÖD is back in the studio working on Hexhammaren, their seventh full-length album, which is being recorded by Fredrik Nordström at Studio Fredman in Gothenburg, Sweden. The new album will be issued on Southern Lord in North America and on Century Media in other countries, with a tentative release set for May 2019. The band also has a few live dates scheduled for April, listed below, and expects additional updates in the coming months.